Instead of us just telling you how good we are, we asked Dublin-based photographer Gareth Byrne to tell us what he thinks of our cloud-based Sage One Accounts software. 1. Hi Gareth, could you please give me a brief summary of who you are, what you do and the name of your business? 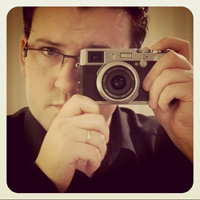 My name is Gareth Byrne and I am a Commercial Architectural Photographer based in Dublin. I have been self employed for over ten years. I am a sole trader and I work from home but I also have a virtual office in Dublin City Centre. I started using Sage One Accounts a year ago and the difference is incredible. I have always managed my own bookkeeping successfully but in recent times my accountancy software needs changed. I am a Mac user and to operate most standalone accounts packages I would be completely reliant on running a Microsoft Windows virtual machine (e.g. Paralells). Whilst this is fine most of the time I was finding myself in circumstances where clients were requesting copies of statements and invoices, so having a cloud-based service that I can operate from an Apple iPad while on the road is very convenient. I can now log on from my iPad, resend invoices whilst I’m on the road, send statements and much more. For me, the speed of getting paid quicker is attributed to the convenience of Sage One. The best thing about Sage One is the ease of use. It gives me the essential accounting tools to run my business without being too complicated. I found the transition effortless and because of its simplicity I find myself getting paid more quickly. The ability to have all of my recurring monthly direct debits on repeat mode for expenses also cuts down significantly on the time I need to spend on bookkeeping. I would advise someone starting out in business to use software such as Sage One and get a good accountant for your annual return. If you charge VAT, Sage One makes this process effortless. Don’t let paper work build up! If a bill arrives, enter it as an expense as you go along. If you complete a job do the same, This way you never have a long list of things to do each month end. If you’re a business in the UK or Ireland and want to get your finances in order, Sage One Accounts is the online accounting solution from Sage that costs just £10 + VAT per month (or €12 + VAT per month) and includes free 24hr telephone and email support. Sign up for a free 30 day trial today!